Some Tokyo sushi shops are hard to find. 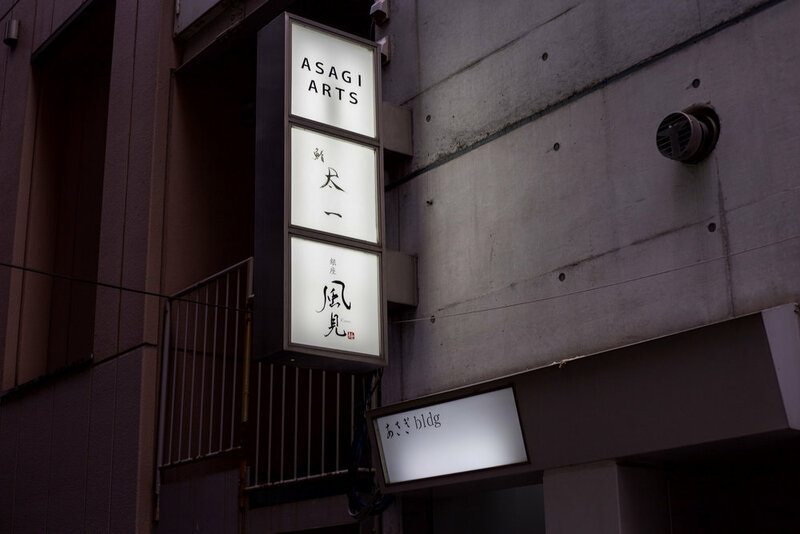 They're in a back alley, up a flight of stairs, with little signage other than the name of the shop in kanji characters. This is by design, it is how the owner chef wants it. He does not want tourists to wander in. He does not want Michelin inspectors stopping by. He wants his regular customers to be able to come in whenever they want to. Sushi Taichi is such a place. Taichi Ishikawa-san has been operating his L-shaped, nine seat counter in Ginza since 2008, and has gained a very loyal local following. 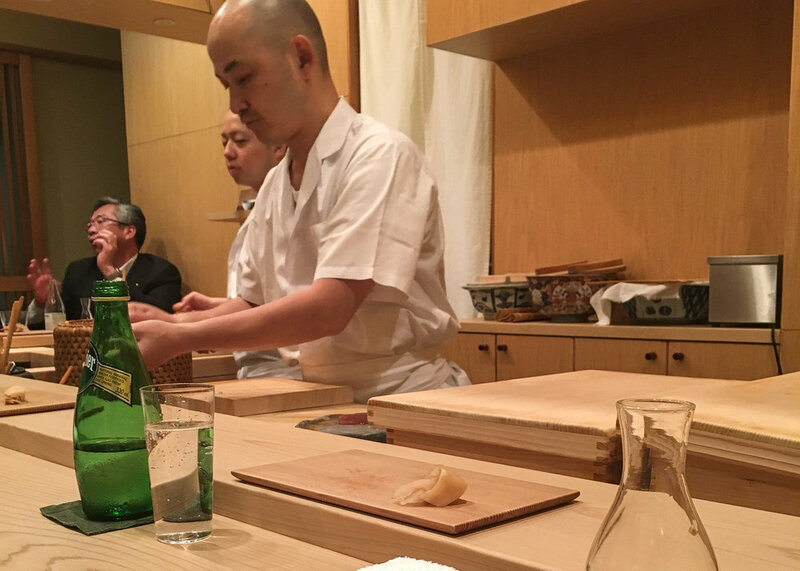 His sushi is fairly classic in style: pieces are on the larger side, shari is seasoned with akazu and sea salt, and neta is of very high quality, with an emphasis on seasonality. Taichi-san doesn't try to get the very best, most expensive toro, he'd rather procure highly seasonal offerings instead. Because of this, he's able to maintain a high level of quality while keeping prices fairly low. My recent omakase meal last Thursday evening cost ¥35,000 for two, including plenty of beer and nihonshu. In the two and a half hours we were there, Taichi-san prepared a delicious series of tsumami and nigiri too numerous to recall. I'd guess I ate 6 or 7 plates of tsumami and upwards of 20 pieces of nigiri. The place was full of regulars, the sake flowing, and the food delicious. I opted to take some photos with my iPhone 6S instead of the Canon DSLR; Sushi Taichi is one of those places where it would feel awkward to take photos with a big camera. Below you'll find images of some of my favorite pieces, along with tasting notes. Note that reservations are absolutely required for both lunch and dinner. Ishikawa-san speaks English and is quite friendly, but it is recommended for foreigners to go with a Japanese speaker. Sakura ebi tsumami - in season in May for just a few weeks. Excellent. Akagai - in season and also wonderful. Awabi - soft in texture, and full of umami. Huge serving of very good torigai. 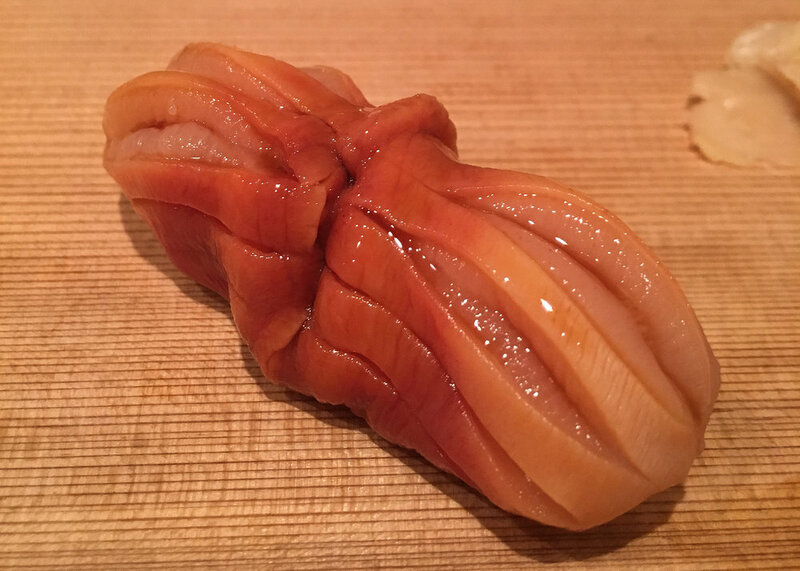 Nice piece of flavorful akami, this piece was between akami and chu-toro. 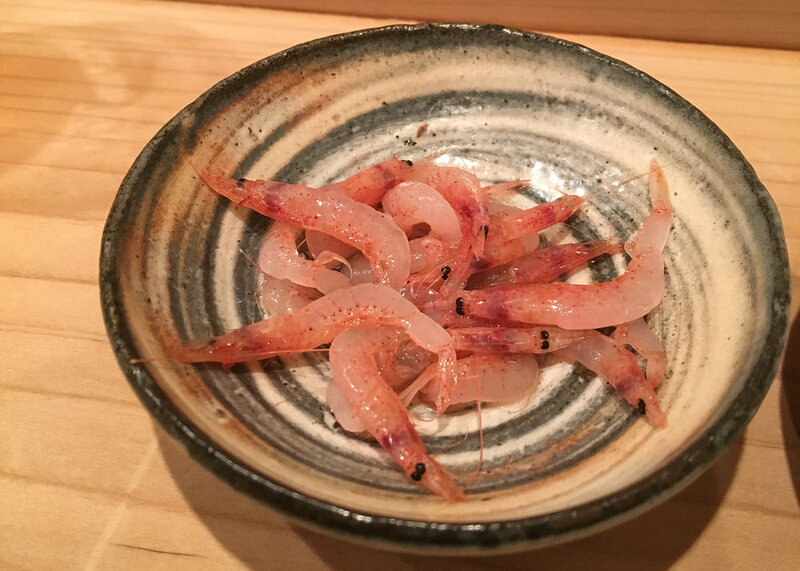 Kuruma ebi - always one of my favorites. 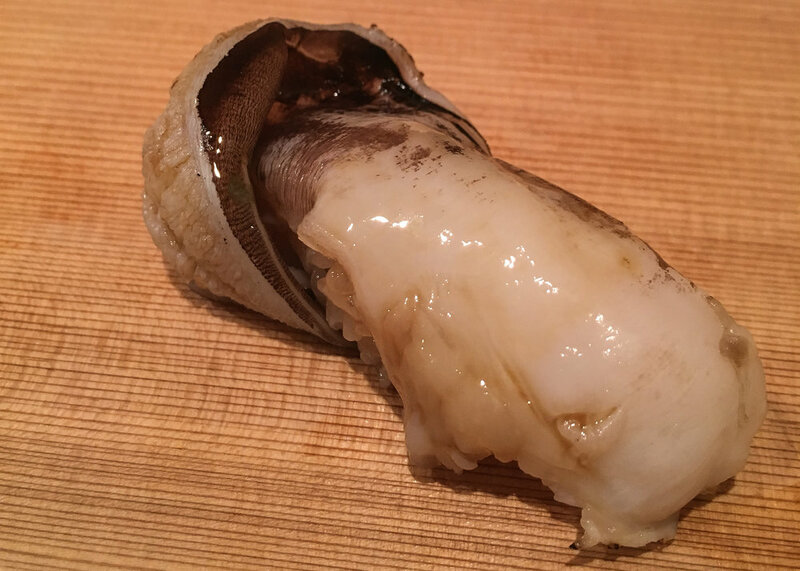 Kohada is not in season now but Taichi's version was still balanced and flavorful. 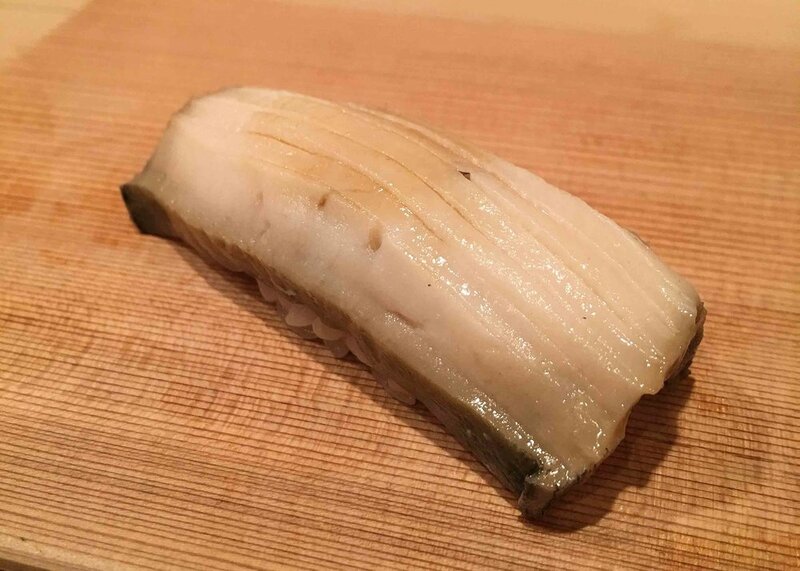 Good, fatty anago with very good tsume. Taichi-san's tamago is one of my favorites. Dense, and with a lot of umami.